#FiveThoughts: Daniel Colman nearly repeats, Jason Mercier still mashing, and PokerStars doing DFS. In 2014, working at my second World Series of Poker as a tournament reporter for PokerNews, I got the assignment to cover Event #40: $10,000 Heads-Up No-Limit Hold'em Championship. There, sensei Mickey Doft was pointing out some of the players I wasn't familiar with to help get me set for the day's coverage. One of the players he identified for me was one Daniel Colman. This young man, I was told, made his name crushing hyper-turbo sit-n-goes online and had begun successfully transitioning into big-stakes live poker with a $2 million score at that year's European Poker Tour Monte Carlo Super High Roller. I made a mental note to follow Colman closely. I missed the end of his first match, but did catch some of the fireworks as he sent Jason Mercier and Joseph McArthur packing in the next two rounds. Colman went on to finish third in the event, losing to eventual champ Davide Suriano in the semi-finals. Though the heads-up sit-n-go format, rife with variance as it is, perhaps doesn't serve as the best indicator of skill, I was impressed enough with Colman's performance and especially his résumé to take him in a One Drop fantasy draft against a friend. That friend picked Daniel Negreanu — I won when Colman defeated him heads up for the title (thanks, Colman!) and $15.3 million. The well-documented media controversy that ensued didn't slow him down one bit. Colman's incredible run of success after the 2014 WSOP continued with a second-place finish at EPT Barcelona Super High Roller for over $1.1 million — an event won by his mentor Olivier Busquet. He followed that up with a win in the Seminole Hard Rock Poker Open $5,300 Main Event for more than $1.4 million. That final table included Blake Bohn, Joe Kuether, John Dolan, and Mike Leah, whom Colman beat heads-up. Fast-forward a year, and after another excellent run in the One Drop — he finished third this time for more than $1.5 million in the $111,111 buy-in version — Colman returned to his stomping grounds at the SHRPO in Hollywood, Fla.
Again, Colman navigated his way through a big field — this time 907 players — to the final table of the $5 Million Guaranteed Main Event. He entered in a virtual tie for second with 61 big blinds, behind chip leader Randy Pfeifer, who had a monstrous 134 big binds. Colman worked his way to a three-handed battle against Omar Zazay and Brian Phillis. There, he ultimately fizzled out after running into a cooler where he flopped second set with the against Zazay, who flopped a king-high straight with the . Zazay would go on to win the tournament for $1 million. Colman earned $310,000, adding to a tournament tally that's up to more than $24 million. His total now trails only Negreanu, Antonio Esfandiari, and Erik Seidel on the all-time money list, and all three have had many more years to pad their résumés than Colman. Regardless of what you think of Colman personally, what he has accomplished on the felt, both live and online, is truly incredible. He has put together a ledger that's the envy of almost any player, one that stacks up against legends of the game with decades of experience. As our own Donnie Peters noted on Twitter, Colman's live results included 14 final tables in 26 cashes and nine top-three finishes before this finish. Colman has made his feelings about the game well-known, so he might be a player who quickly fades from view if he decides he has won a sufficient sum of money, whatever he considers that to be. But it's hard not to wonder what he could accomplish if he stays motivated and keeps grinding at this pace. Also at the SHRPO, another of poker's brightest young stars captured a major win. 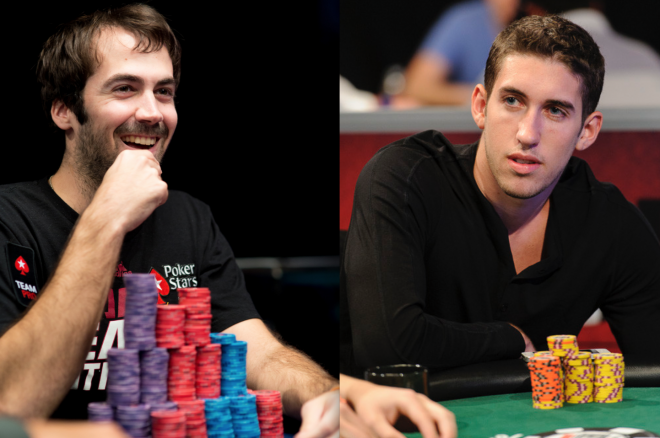 Jason Mercier took down the $25,400 High Roller for $517,000 after a chop with runner-up Ian O'Hara. Mercier beat out a field of 83 and a predictably tough final table that included Barry Hutter, David "Doc" Sands, Phil Laak, and David Peters. The Florida native defended home turf with his win, the latest score in a scalding-hot run for Mercier. He banked huge live scores at the WSOP with a second-place finish in Event #54: $10,000 Pot-Limit Omaha for $572,989, seventh place in The $50,000 Poker Players' Championship for $139,265, and first place and a bracelet in Event #32: $5,000 Six-Max No-Limit Hold'em for $633,357. The virtual felt has also been kind to Mercier, as the Team PokerStars Pro shipped three tournaments in PokerStars' Spring Championship of Online Poker for roughly $250,000 total and made two other final tables en route to SCOOP Overall Leaderboard Player of the Year honors. The win will help Mercier put some distance between he and second-place Byron Kaverman on the Global Poker Index rankings. More importantly, it should push him further into contention for GPI Player of the Year honors. There, he currently sits in 13th, but at the rate Mercier is laying waste to everything in his path so far this year, don't be surprised if he's atop that list as well by the end of 2015. If you did the math on the first "thought," you may have noticed that 907 players paying $5,000 each in buy-in money for the SHRPO Main Event meant a prize pool of $4,535,000. That's short of the guaranteed $5 million, so for the second year in a row, Seminole Hard Rock took a hit with an overlay in their showcase event following the WSOP. After a monumentally successful 2013 event that drew 2,384 entries and crushed the ambitious guarantee of $10 million, the SHRPO crashed back down to Earth amidst fiercer weekend competition in 2014 with a turnout of 1,499, creating an overlay of about $2.5 million. For 2015, event organizers switched from a multiple starting day reentry format to a traditional freezeout with one starting day and half of the old guaranteed prize pool. With the move to a freezeout failing to pay dividends, one has to wonder what the next step is for the SHRPO. The tournament remains a popular destination — 907 entries for a $5K is about double anything the WSOP pulled in three such tournaments this summer — but clearly expectations have to be tempered a bit. My main hope is that the SHRPO and other tournament organizers don't shy away from running more freezeouts as their main events. Recent years have seen the reentry format spread to the point of ubiquity, something of which I'm not a huge fan. I think the freezeout format creates a more strategic and interesting game from start to finish when compared to a reentry, which often sees early levels filled with gambles and meaningless bustouts by players with deep pockets who know they can simply fire another bullet. I recognize that there's a desire from players to get their money's worth on a long trip and not simply be out of luck if they run into bad spots early in tournaments. But I think the poker world needs a balance between different tournament formats, and hopefully others won't be dissuaded by the SHRPO falling shy of a guarantee that would have been easily met if reentries were allowed. Amaya, the parent company of PokerStars, reached an agreement sometime in the last few weeks to acquire Victiv, by some estimates the No. 3 daily fantasy sports site after industry giants FanDuel and DraftKings. Amaya had already announced a planned entrance into the DFS marketplace and officials said they wanted to be operational by the time NFL season rolled around. The acquisition news came as little surprise to many since Amaya's timeline for launch was drawing near and there had been no product rollout. What does the acquisition mean for poker players? Amaya's entrance into the U.S. market using the name "StarsDraft" — the rebranding will take place prior to NFL kickoff, according to Legal Sports Report — will help keep the PokerStars brand alive and kicking in the states. If and when regulation does hit, having players with accounts under the Amaya umbrella should help bring crossover traffic to the virtual felt. Furthermore, many expect regulation to hit the DFS industry at some point. If that does happen, the trust and relationships Amaya builds with regulators will hopefully transition into the battle for the return of online poker. Seems like good news to me on a front where any is welcome. Just like last year, the coming of August means another season of the European Poker Tour is underway with EPT Barcelona, the first of six festivals on the Season 12 schedule. The Barcelona stop will be followed by EPT Malta in October, EPT Prague in December, the PokerStars Caribbean Adventure in the Bahamas in January, EPT Dublin in February, and EPT Monte Carlo in April. Barcelona proved to be the most popular stop on the tour last year, drawing 1,496 players. When the dust had settled, Andre Lettau emerged as champion and pocketed €794,058 as his share of a three-way deal with Samuel Phillips and Hossein Ensan. Poker fans will have plenty of action to follow this year, with a €50,000 Super High Roller, a €26,000 Single-Day High Roller, and a €10,300 High Roller in addition to the €5,300 Main Event. Live coverage will kick off on Aug. 22 right here on PokerNews with the Super High Roller, so be sure to tune in as another season of the prestigious EPT begins.